Sometimes really cool events come up that inspire you to go on a road trip. On a visit to Vancouver’s Bomber Brewing I was made aware of the East Kootenay Beer Festival at Fairmont Hot Springs resort in the Far Eastern portion of the Province right on the Alberta border. 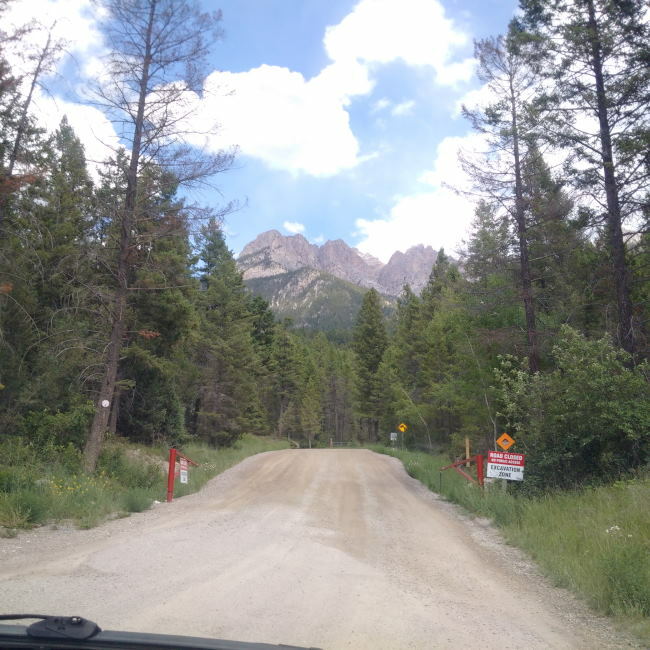 If you have been following this blog for a while you will know that last year I did a road trip around the Kootenays and loved it (Click here to read). On that trip I fell in love with the Kootenays and could not wait to get back (but assumed it would be years before being back). A beer festival held at the base of a ski resort that happens to be at a Hot Springs resort sounds like a match made in heaven. Already using many of my holidays I took a long weekend to attend the festival. On Friday June 19th my Mom and I hit the road around 9am for our 850km trek to the resort. Heading to the resort we headed East on Highway 1 until we got to the Coquihalla Highway. The Coquihalla Highway brought us to Kamloops where we joined back up with Highway 1 until Golden. Once in Golden hundreds of km from home we took highway 95 South to the resort. The drive is very picturesque and will take your breath away! On arrival to Fairmont Hot Springs we were greeted with a welcome to the 4th annual beer festival. Seeing as the last time I was at this resort it was only to use the public hot spring pools as my Girlfriend and I were camping down the highway we did a bunch of exploring around the resort. Besides the Hotel portion of the resort there is also camping (although I think it was only for RV’s). They also have a golf course and it looked like a mini golf course but I only spied it while driving by. On top of this they also have a ski hill which rounds out their Winter operations and this is where the festival was to be held on Saturday June 20th. Seeing as I wanted to get up early on Saturday to hit up the hot springs as well as head into Invermere to visit Arrowhead Brewing I headed to bed at a pretty reasonable time. Once Saturday rolled around wristbands could be picked up after 1pm that would allow you into the festival grounds. Shuttle buses started at 3:30pm to bring you up the 3km access road as the festival ran between 4pm and 8pm. The brewery list was fairly impressive considering the distance some of the breweries had to travel including all three Victoria Breweries that came! The cost of the festival on its own was $49 and was all inclusive for the beer while food could be purchased from a food truck and the bbq stand. There was live music played by the band Cod Gone Wild and they rocked it. The festival was a blast! Between the live music, beautiful setting and a bunch of beer that I had actually never been able to sample I was totally in my element. The people from the Kootenays were amazingly friendly as well as all of the Albertans and the odd crazy person like me that came a long way to partake in the festivities. I would not hesitate to head back to this festival in future years. The beer was served from packaged products (Bottles and cans) as well as from tap depending on how the breweries transported it. In some ways I would have to say that I had more fun at this festival than most I have been to. Yes as a blogger and beer traveler I know many of the brewery staff but I did not know one festival goer at the festival! I made some many great short term (festival) friends and had a ton of great conversions with interesting people. There was even an after party at the ski lodge from 8pm until 11pm with a cash bar and other live music. I headed down the mountain without sticking around for the after party to meet up with many of the brewery staff for more beer and a soak in the hotsprings. Sadly when Sunday rolled around my Mom and I had to hop back in the car for anouther marathon drive. This time we took the South Route though and went through Osoyoos and Manning Park on the way to Vancouver. This drive is a at least an hour longer than the Northern route but just as pretty. For the sake of showing the entire route we took on the 1800km trek here are two maps one close up of the entire trek and one of the entire province of BC for scale. I had an epic time in the Kootenays and so did my mom and I look forward to getting back sooner than later! The East Kootenay Beer Festival for 2016 has already been announced so think about saving the date June 18th, 2016! 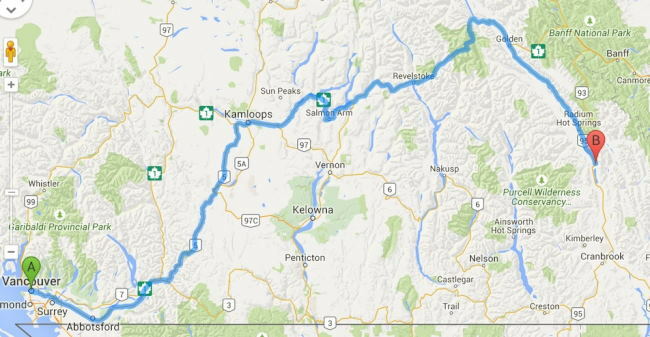 The long weekend model is quite feasible for Albertan and Okanagan residence and I would not hesitate to recommend considering going this route. If like me though you live further West or even further North or South I would recommend taking a week and taking a few days to explore the province on the way to and from the Festival. The Kootenays also have so much to offer in the way of Hot Springs, Breweries, hiking and really any outdoor activity you can think of. Once you get to the Kootenays don’t run away as you will love every second you linger in this beautiful countryside. If you can’t make it for the East Kootenay Beer Festival take a trip out to Fairmont Hot Springs Resort when you can you will not be disappointed! 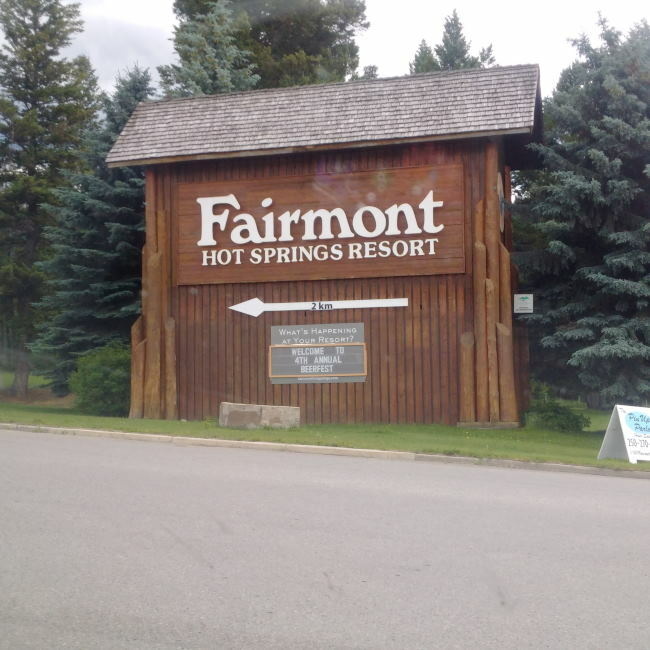 Congratulations Fairmont Hot Springs Resort for putting on a very successful event this year! So if you are as crazy as I am and live in Saskatoon you could make it to the festival in the same time it took me! This entry was posted in Beer Travel, Tasting Event and tagged #EKBeerFest, 4th annual, Arrowhead Brewing, Banff Ave Brewing, beer fest, beer festival, beer tourism, beer travel, big rock brewery, Big Rock Brewery (Alberta), Big Surf, bomber brewing, bravo beer co, cannery brewing, Cariboo Brewery, craft beer, east kootenay beer festival, east kootenays, fairmont hot springs, fairmont hot springs resort, fernie brewing, hoyne brewing, kootenays, last best brewing, McClelland Imports, moon under water, Mt. Begbie, Okanagan Springs, Pacific Western (Scandal), phillips brewing, Prohibition, Rider Cider, road trip, Russel Brewing, Scandal, stanley park, steamworks, Wild Rose Brewery, yukon brewing.